Today’s prayer from my heart is concerning anger and bitterness. I will admit that I have spent most of my life being a pleasant person by all outward appearances while inwardly, I was very resentful with an extremely short fuse. I had grown to accept it as being a part of my personality; however, the devil is a liar! After I was baptized for a second time because I chose to rededicate myself to God, I faced a heavy onslaught of spiritual attacks that were designed to test those characteristics that clashed with the kind of nature God says women are to possess and demonstrate as Christians. 1 Peter 3:4 says “….it should be that of your inner self, the unfading beauty of a gentle and quiet spirit,”. But my nature was nothing like the nature God encourages wives to have. My husband and I clashed and bumped heads and, then I cried out to God for help. I was so tired of feeling angry and bitter inside because I wasn’t able to contain it. It was spilling forth into my marriage and family life was also affected. God heard my cry and pointed out two clues found by the example of two sisters in Christ that I should pay attention to. One is named Joy and the other is named Sarah, ironically! God has a sense of humor about it because basically what it boils down to is if I don’t want to be an angry, bitter wife, my joy must be in Christ, and I need to be willing to submit to my husband as a daughter of Sarah. I need to have the gentle attitude and gracious disposition that Sarah had for her husband Abraham. 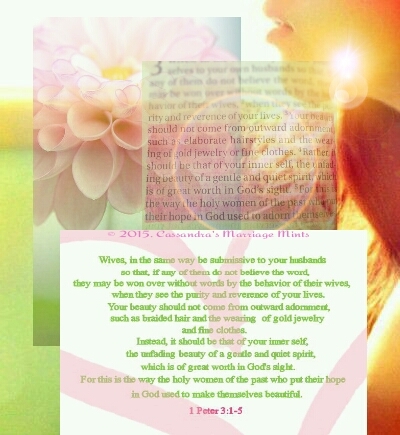 1Peter 3:5-6 ” For this is the way the holy women of the past who put their hope in God used to adorn themselves. They submitted themselves to their own husbands, 6 like Sarah, who obeyed Abraham and called him her lord.You are her daughters if you do what is right and do not give way to fear.” Everyday I need the Lord because I can’t have the gentle, quiet inner beauty inside my heart in my own strength. God has shown me that the anger was a messy residual defensive tactic I used to protect myself, kind of like an armadillo. I used anger as an armor to protect my heart because as a little girl I was dejected and downcast. I grew up feeling like something bad would happen if I was happy or joyful; so I was careful to be very solemn and serious. In addition, throughout the years, I had felt the sting of rejection, and continued that habit of being downcast–expecting the worst when it came to myself. God knows I need His help to even experience joy! His Word promises: “Don’t be dejected and sad, for the joy of the LORD is your strength!” (Neh. 8:10) Amen! Enough about me. Let’s pray for you and me. God’s got this! No matter the reason why you are angry or bitter, God wants to heal you! Dear Lord, cleanse our hearts. Soften our spirits. I repent of holding on to grudges and offenses where others have erred against me. Help me release bitterness in my heart and fill me with Your love. Father, we do not want to be vengeful like Jezebel, ready to act on fury, so we can have the last word and take the credit and glory. Lord, help us be daughters of Sarah who bring,You glory by our holy conduct and inner disposition. Lord, send each wife mentors and friends who demonsrate the beauty of a gentle and quiet, spirit. Thank You that we can be women of strength because our strength comes from You, not from negative emotions and patterns of conducting ourselves. Father, deliver us from the urge to hold others in contempt in anger and resentment. Your Word says the earth.. “under four it cannot bear up..a contemptible woman who gets married…” (Prov.30:23). I pray for every contemptible quality of: our hearts, natures, temperaments, speech, conduct, thought life. Lord, expose all that is contemptible inside of us so we can repent of them. We don’t want to be unbearable women at whose presence even the earth shudders at in repulsion. Thank You that we are new creations in Christ Jesus and and we are worthy and gracious! Thank You that we can do all things in Christ, who, strengthens us! In Jesus’ name, Amen! This is The definition of “contemptible” and I rebuke the spirit of anger and bitterness in JESUS’ name!!! ©Cassandra’s Marriage Mints. All rights reserved.